Namco Bandai has apologized for using an image of Mr. Driller to welcome the recent rescue of 33 trapped Chilean miners, calling it "inexcusable." Assuming you haven't been living on Mars for the past several months, you know that 33 miners in Chile were recently rescued after spending 69 days trapped in a collapsed mine. 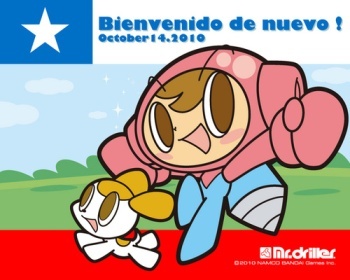 The last miner came out on October 14 and to mark the moment, Namco Bandai released an image featuring Mr. Driller and the Chilean flag, along with a message that notes the date and says, "Welcome Back!" Mr. Driller is name of a series of Dig Dug-style videogames that debuted in arcades in 1999 and have since come out for the PlayStation, Game Boy Advance, Xbox Live Arcade, WiiWare and more. The lead character, Susumu Hori, aka Mr. Driller, is actually billed as the son of Dig Dug hero Taizo Hori. But the image was apparently in rather poor taste in the eyes of some, because just a day later Namco Bandai took it down. What exactly sparked the removal is unknown but the company said on Twitter that it "lacked consideration," adding, "We would like to offer a profound apology to everyone. It was inexcusable." Tasteless is in the eye of the beholder and maybe I'm a bit jaundiced in that regard, but the truth is that I'm really having trouble seeing what all the hubbub is about. A friend suggested that it was akin to using the WWE wrestler Earthquake to congratulate the survivors of an earthquake, which I think we can all agree would be pretty awful, but I don't believe the two situations are similar enough to warrant a comparison. Namco's image, while perhaps self-serving, was in my eyes just an expression of joy over a very happy ending to a story that could easily have gone the other way. Goofy maybe, but far from inexcusable. Am I off-base here?